There are four opportunities for Columbia/Howard County high school students to travel abroad next summer and experience the life of a teen in one of Columbia’s four sister cities: Cergy-Pontoise, France; Tres Cantos, Spain; Cap-Haitien, Haiti and; Tema, Ghana. Become a student ambassador by participating in one of Columbia Association’s annual Sister Cities High School Student Exchanges. Spend two weeks in July living with a teen your age, then host the same teen here for two weeks. Immerse yourself in another culture, living with a family in France or Spain, improve your French or Spanish language skills and have fun while exploring new places and connecting with international students your age! Teen participants in the annual Sister Cities High School exchange program spend approximately two weeks of cultural and linguistic immersion during the summer in one of Columbia’s European sister cities: Cergy-Pontoise in France or Tres Cantos in Spain. During this time, they are hosted by the family of a French or Spanish student. After returning to the United States, students will then host their French/Spanish counterparts for another two weeks. Throughout the trip, there are organized group activities for the participants, both abroad and in the U.S. Participants in the summer 2019 Exchange will depart with their respective chaperoned groups for France or Spain on Saturday, June 29. They will return to the U.S. on Monday, July 15. The Spanish and French teens will arrive on July 17 and the program then runs here until July 31, 2019. The program fee is $700 for Columbia residents and $850 for nonresidents, excluding airline tickets. Airline tickets in summer 2019 will range from $1,100 to $1,400 per participant. Applicants must be high school students residing in Howard County who have completed high school level three of French or Spanish by the end of the current academic year (or have the equivalent language fluency). The Application Packet includes detailed information about the program, a checklist, the Student Application, and forms to be completed by parents. The application deadline has been extended to March 1. There are excellent scholarships available for those who qualify. For more information, contact Program Manager, Laura Smit at 410-715-3162 or International@ColumbiaAssociation.org. Columbia Association is accepting applications for volunteer chaperones for its summer 2019 Sister Cities High School Exchange. Adults over age 21 who speak fluent Spanish and French (as well as English) accompany each group of students to France and Spain. Chaperones attend, supervise and participate in all organized group activities, both abroad and in the U.S. Chaperone plane tickets are covered. Chaperones must participate in both parts of the Exchange: in France or Spain and here in Columbia/Howard County. The Chaperone Application Packet provides an overview of the requirements to be a chaperone for the Sister Cities High School Exchange, as well as the Chaperone Guidelines and Responsibilities.HCPSS middle and high school Spanish and French language teachers are encouraged to chaperone the Sister Cities High School Exchanges. For more information and/or questions, contact Laura Smit at 410-715-3162 or Laura.Smit@ColumbiaAssociation.org. The Application deadline is March 15, 2019. Want to make a difference and have an amazing experience this summer? Join the Build Haiti Foundation on a once-in-a-lifetime trip to Haiti Summer 2019. 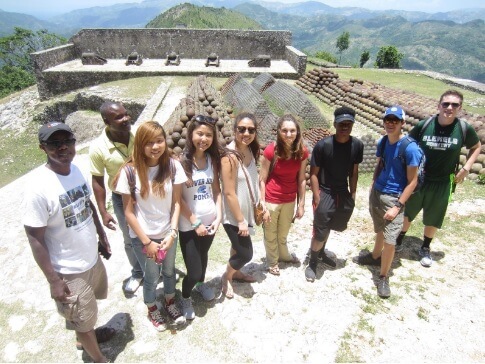 As a member of the Haiti Global Leadership Program, participants will experience Haitian culture, engage in interactive community leadership activities with Haitian students, and work directly with Haitian youth on strategies for addressing alternative energy, waste management, preventive medicine, vocational training and business initiatives. Participants live with adult leaders in a house in the small village of Camp Coq, outside Columbia’s Sister City of Cap-Haitien, visit a health clinic, tour the city of Cap-Haitien and visit the capital of Port-au-Prince to learn about the urban challenges Haitian people face. They also help organize a soccer tournament with local youth; enjoy scenic beaches; visit the historic UNESCO designated World Heritage Site, the mountaintop fortress of Citadelle; visit local markets and restaurants and; listen to Creole music. This trip is for students in grades 10-12 enrolled in Columbia/Howard County high schools, as well as homeschool teens. There is no foreign language requirement, as English is the language of government and instruction. Students will travel to Ghana in West Africa as a group with adult chaperones. In Columbia’s sister city, Tema, they will live in a school dormitory or hostel. On trips, they will travel as a group and stay in hotels. There will be opportunities to meet with Ghanaian high school students in Tema and Accra. Tours will be organized for travel by bus to the capital, Accra, as well as Kumasi (Ashanti Region) and Cape Coast — where the group will tour the slave castles and discuss the international slave trade. There will be opportunities to experience the music, dance and culture of Ghana, as well as participate in a service project. For more information about the July trip to Ghana for high school students, please contact Laura Smit, program manager for CA’s International Exchange and Multicultural Programs, at 410-715-3162 or International@ColumbiaAssociation.org.